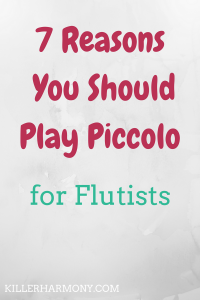 Flutists: Should You Play Piccolo? If you are a flutist, odds are you have come across the piccolo at some point. The piccolo is a member of the flute family, and it can be a vital tool in a flutist’s arsenal. I first got into the piccolo a few years ago when I got my own instrument. I still have it and use it a lot; it’s an Armstrong 204 piccolo. As a flutist, playing the piccolo has opened a lot of doors. So, in short, yes you should play piccolo. Here are a few reasons why. 1. You’ll have more opportunities. Playing the piccolo, even if it is not your specialty, will open many doors for you. You open yourself up to more solo, chamber, and large ensemble repertoire. While there is not much in the way of solo music for piccolo, the repertoire is growing. And if orchestral playing is of any interest to you, piccolo is super important. Even the principal flute has to play piccolo occasionally. You can also take on doubling gigs, which is where you are required to play both flute and piccolo. You don’t have to be the best piccolo player, but you should know the basics. 2. You’ll have a unique part. If you play in a concert band a lot, playing piccolo is a great change from flute. While the piccolo usually plays with the flute section, it does have its own solos. This past year, I had a few piccolo solos in my university band, and I would not have had a solo otherwise. Even when the piccolo plays with the flutes, it will be heard more. The piccolo is a higher pitched instrument, and the sound will naturally carry over the band or orchestra. You have a bit more leeway with piccolo, because you are your own section leader. You will be heard amongst all of the other instruments, and it’s cool to get some solos. 3. It will help your flute playing. I know, it sounds crazy. The piccolo requires a different, smaller embouchure, so how could it help your flute sound? Playing piccolo is harder than flute, and it requires a lot more skill, muscle control, and proper breathing. All of those techniques from the piccolo can be transferred back to the flute. When I switch back and forth, I notice an improvement in my flute sound, for sure. Playing the piccolo will also help with your ability to tune. The piccolo requires a more accurate pitch when tuning, and you have to make more adjustments. This will improve your aural skills. 4. It will make marching band easier. If you are required to participate in a marching band, playing piccolo is something to consider. It is much easier to achieve a proper stance with piccolo than flute. The piccolo is held closer to the body, and you can turn easier and your arms will not be so tired. Another benefit to piccolo on the marching field is that you will be heard. It is almost impossible to hear concert flutes outside amongst dozens of brass instruments and the drum line. The piccolo will carry more through the field, and that part won’t get lost. 5. You can take it anywhere. Now, that doesn’t mean you can just pull out a piccolo in the middle of the library. Though I have done that for scheduled performances :). You can stick your piccolo in almost any purse or bag you have, so it is super easy to take it with your flute. There are also some flute cases that have a pocket or section for a piccolo. Being able to put a piccolo almost anywhere means that you can whip it out at a moment’s notice. You won’t have to worry about not having room for it when heading to a rehearsal or performance. 6. It’s expected of you. At the collegiate and professional levels, it is almost always expected of you to play piccolo and to have your own. Whether you are going to be playing in an orchestra or a studio, a piccolo is a necessity. If you take a job that requires piccolo and you can’t play it, that will make you look bad. You don’t want that. That being said, not every flutist plays piccolo, so having it as a skill can set you apart when it comes to finding jobs. For the aspiring private teachers out there, piccolo can also open you up to more students. While most flute players start out on the concert flute, some will want instruction on the piccolo. The last thing you want to do is turn a student away and send them to your competition. Not everyone will enjoy the piccolo, but if you do, there’s no better reason to play piccolo than that. I really love pulling it out and playing everything from Vivaldi or Telemann to Gordon Jacob. Piccolo gives me a nice break from the flute, and it helps my flute playing in the process. The piccolo is a great way to take a break from the concert flute without having to take a complete break from music. Have you played the piccolo before? Did you enjoy it? Let me know in the comments! Don’t forget to subscribe below for access to exclusive music tips and worksheets, delivered straight to your inbox! Next Next post: Are Private Lessons Necessary?